Rusty bikes, fast food packaging, bottles and cans were among the detritus cleared away (photo: Richard Street). 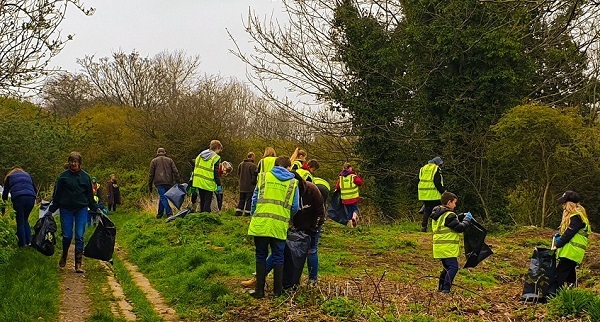 More than 50 people turned up last Saturday morning to lend a hand with clearing rubbish from Speckled Wood in Ore, including 15 cubs and scouts from the 4th Hastings group based in Ore, together with their parents, and more than 40 local residents with their children and dogs. They were among the more than half a million across the country who participated in the Great British Spring Clean organised by Keep Britain Tidy. Between them they filled a skip (generously loaned by French’s Skips) with everything from rusty bikes, fast food packaging, bottles, cans, bags of clothes and much more, all of which had been dumped in this local “green lung”. 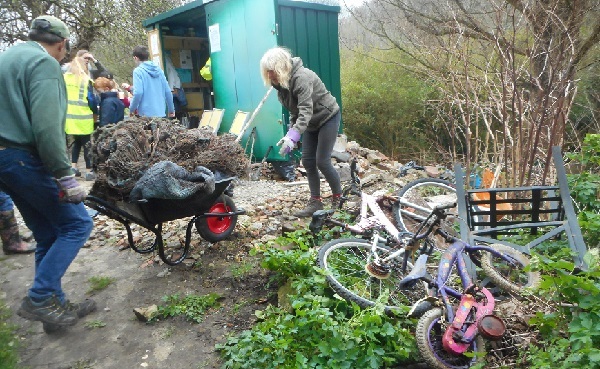 “I was delighted to see so many people turn out to volunteer for this Great British Spring Clean in Speckled Wood today,” said Jim Breeds, Ore CLT chair. “This was a remarkable demonstration of the community coming together to tackle a terrible litter problem in our Wood. Ore CLT successfully campaigned for the area to be removed from the Council’s housing allocation sites and last year acquired part of the wood from the Council. We are seeking to buy those areas still in private ownership so that it can be preserved as community green space in perpetuity. We would also welcome more volunteers to help in the maintenance and management of the wood. See here if you’re interested.